Complete My Album offers customers up to 180 days after first purchasing individual songs from any qualifying album to purchase the rest of that album at a reduced price. When users buy any song on iTunes the corresponding album will immediately appear on their personalized Complete My Album page with the reduced price listed. Once again, the Cupertino company is at the leading edge in customer service and satisfaction. Wonder how long it will be before Zune and Rhapsody go down the same road? I thought the idea of music delivery via mobile phone was cool until I saw the price tag. Whoever dreamed up this business must have been looking back with greedy eyes at the compact disc’s birth. In 1983, no one gave a second thought to paying twice the price of a vinyl album for a CD. But when iTunes launched, the price of an album actually went down, to $9.99 or less. Of course, songs were famously sold for 99 cents each. 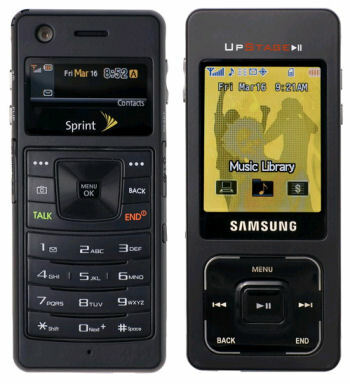 So what did Sprint do when it rolled out the first mobile phone music store in 2005? Priced songs at $2.49 each. Music was delivered slower and at a higher price. Sprint honchos thought things were going swimmingly back then, but total track sales to date are a paltry 15 million. So this week Sprint announced they were cutting the price to … wait for it … 99 cents a track. A few additional features in Sprint’s press release are even more interesting to me. Sprint Radio offers up to 50 music streams, and there’s also a free music page with 10 songs a month. Spring also announced that Samsung’s new two-faced Upstage phone will ship in April, and there’s five other Sprint Music Store-compatible phones offered at 99 bucks, with a 2-year agreement. Of course, long-time Sprint customers (like me) are out of luck there. Is it just me, or are most cell phone providers completely backwards? They punish loyal customers and give great deals to people they’ve never met. It sounds like the dating game back before I got married. One more thing – Sprint’s press release attempts again to flog the only idea dumber than 3 dollar a whack songs and ring tones – cell phone television. Good luck on that one. Now that even digital music revenue growth is faltering amid rampant file-sharing by consumers, the major record labels are closer than ever to releasing music on the Internet with no copying restrictions — a step they once vowed never to take. Indie labels have been doing this for some time on sites like eMusic. The straw that broke the camel’s back could be Microsoft’s decision to abandon its Plays for Sure partners with the Zune. It also could throw a spanner into iTunes’ works.